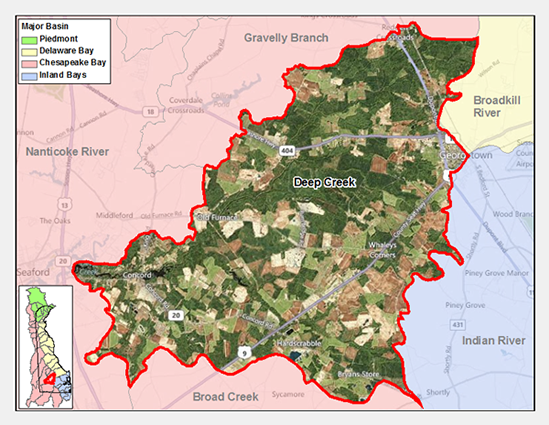 The Deep Creek Watershed is part of the Nanticoke River Basin. Deep Creek Watershed supports extensive submerged aquatic vegetation beds that are used for fish spawning, cover, and nursery areas for fish like sunfish. Siltation caused by shoreline development and destruction of shoreline buffers is a major destructive factor, killing submerged aquatic vegetation beds and smothering egg masses that are within the beds. This type of alteration would severely affect shellfish, plant, and fish species by direct take, and by alteration of spawning, nursery, and feeding habitat. Nutrients (nitrogen and phosphorus) and bacteria are issues within the Deep Creek Watershed. 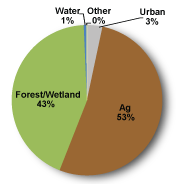 The nonpoint source nitrogen load from the TMDL of the Deep Creek Watershed are to be reduced by 30% and the phosphorus loads are to be reduced by 50%. Also, the nonpoint source bacteria load from the TMDL of the Deep Creek watershed are to be reduced by 3%. The Deep Creek Watershed has three sites listed in the Site Investigation and Restoration Section database. These three sites have undergone a preliminary assessment / site inspection (PA/SI). If you would like to view reports for any of the sites in the SIRS program please follow the link the DNREC Environmental Navigator to search by map for the Deep Creek Watershed.